Oh Merciful and Bountiful Father, I come before you with a heavy heart, weighed down by so many disappointments. You alone know what the future holds and You are the author and finisher of my faith. Lord, there are many times in life where I face disappointments which sometimes causes me to lose my joy. Help me, Oh Heavenly Father, to learn how to dance in the rain, even as the storm rages. Lord, there are many times where opportunities are missed. Help me to remember You will open new doors. Many times, the people in my life make promises. I depend on them and get my hopes up but they fail me on numerous occasions. Help me to remember You will never leave me nor forsake me when I need You, Lord. Many times I lose loved ones and dear friends. 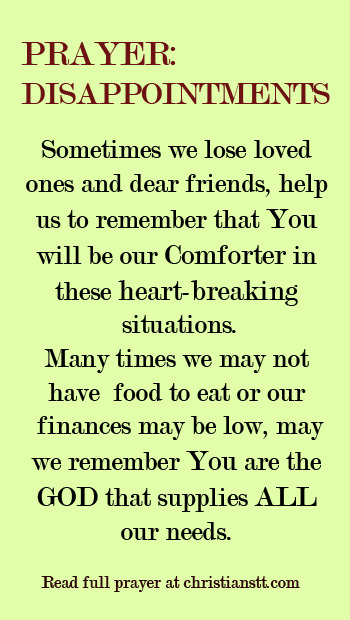 Help me to remember that You will be my Comforter in these heart-breaking situations. Many times I may not have food to eat or finances may be low. But you remind me that you are the God that supplies ALL my needs. Father, there are some days where I just feel weary, down and out because of these disappointing endeavors. I humbly ask that You reach out to Your people. Help me to experience the joy of the Lord because I know for sure this too shall pass and I will call on the name of the Lord and be saved. In Jesus’ Holy Name, AMEN!!! Psalm 30:5 Weeping may endure for a night, but Joy comes in the morning. I thank you to supply all my need. Dear God,Sometimes I face disappointments in my everyday life.Help me to remember,You will give me a way out,and will never leave me,nor forsake me,when I need You dear God. Thank you Lord Jesus,for You always help me,walk with me,and knowing that You holds my future. So that today,I am blessed,stand strong to face and to through out my day. Hoping that Our Lord Jesus walk with me all day long. We thank You for ruling us with Your shepherd’s staff so that again and again we can be refreshed and can delight in what You are doing for us. We thank You that we can have eager, joyful faith even when sorrows come, looking again and again to the good You give us. We are thankful and want to be thankful always. Be a Mighty Lord over the people, we pray/ Father please show Your sovereignty by guarding the flock close beside you and by pouring out Your grace to give help to the needy and comfort to the heartbroken. Lord God, hear and bless us. May Your will be done on earth as in heaven, so that Your kingdom may break in and everything may come right, according to Your great purpose, In the name of Jesus our Savior I pray. Amen. Dear Gaba, thank you for your words of encouragement we are grateful for them. May your heart be strengthened, and may you always live in His presence. and may the good Lord continue to guide you and watch over you wherever you may go.God Bless You. God Bless you Mary for your very kind words. Please know that God loves you so very much and will never leave or forsake you, He knows you by name and you are His.